Using our experience we guide you through the various choices in fabric, styles and products to match your budget and to ensure that both design and functionality are achieved. We can also provide a unique and detailed scale illustration of your window and the design being discussed. This process means you can visualise the design before making your final decision. See our 'Illustrations Service' for a real customer example. While visiting your home we will take all the measurements we need to provide you with a fully itemised quotation. We provide you with an itemised quote and once accepted, we take a deposit, order materials and see the work through to completion. 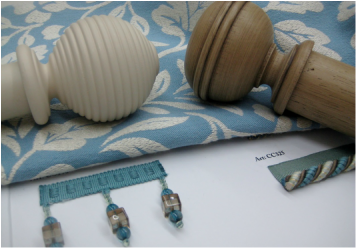 This sometimes means a second visit to your home (after poles and tracks have been fitted) to check final measurements before we begin making your soft furnishings. Finally your curtains or blinds are pressed and dressed and we visit again to deliver and hang them for you. If you require poles or tracks to be fitted we work with a professional fitter who will be able to do that for you. ​Whatever we make for you we want you to love it. From the initial meeting to the finished product, you will be delighted with each stage of the process. We look forward to providing you with a beautiful new window treatment and an enjoyable experience!